You can read the poem in its entirety at Memory and Desire. The Black March figure in the poem is generally presumed to be death, but in the early stages, at least, Black March (the perfume) smells very much alive: it's the scent of wet earth and wet wood in the early spring (the notes are listed as rain drops, leaf buds, wet twigs, tree sap, bark, mossy earth and the faintest hint of spring). The opening is fresh and clean; later, as Columbina points out at Perfume Smellin' Things, it gets darker and more somber. She likens the dry down to the smell of a freshly dug grave. Happily for me, it does not strike me as nearly so somber as that; even at its darkest (and it does get very earthy, more so the longer it's on skin) it stays closer to what March at Perfume Posse called the "smell of thawing soil, spring air and unfurled buds". If Black March is too earthy for you, it layers beautifully with the very green and cedar-y CB 93 (from the Reinvention series, with notes of galbanum, bourbon geranium, holy basil, Siberian fir, scotch pine, Moroccan cedar, candlewood, frankincense and sandalwood), and actually, I'd recommend CB 93 in general as an excellent layering agent any time you have a scent that ought to be greener and woodier than it already is. CB I Hate Perfume M #2 Black March is available in 15 ml Perfume Absolute (perfume oil) or 100 ml Water Perfume. The Water Perfume would, I'm guessing, be called an Eau de Toilette (or maybe an Eau de Parfum) if it were in an alcohol rather than a water base. It's lighter than the Perfume Absolute, and I tend to use it as a body spray. I prefer it to the Perfume Absolute only because I've never liked perfume oils, but it's entirely a matter of personal taste. I will also note that the Home Sprays are the exactly the same as the Water Perfumes but in an even lighter concentration, and they're slightly less expensive. I own Russian Caravan Tea in the Home Spray, and it works perfectly as a personal fragrance. Unfortunately, CB I Hate Perfume doesn't make a Home Spray in Black March at the moment. For buying information, see the listing for CB I Hate Perfume under Perfume Houses. Note: image at top right is Big Wet via ecstaticist at flickr; some rights reserved. Ooo, I love this one. (And the poem, too. Smith is one of my fave poets – along with Frank O'Hara and the more conversational phases of Auden.) I don't wear it as often as I should. It doesn't call out to be worn a lot, I find, but it is just right when it does. LOVE Black March. It is like the HD version of Dirt by Demeter. The first time I wore it from a decant, upon spraying it on, I was immediately transported to my childhood backyard, playing in the dirt with my older brother. Amazing olfactory memories came trickling out. One of these days I will buy a full bottle. I don't wear it as often as I should either. I don't wear anything I love as often as I should! But agree: when you need to smell spring, there it is and it's perfect. “HD version of Dirt by Demeter” is spot-on. I've got a decant at the moment too, but will buy a FB of the water formula when it runs out. It's so nice to have it around. I like this one and I am a dandelion too, but I found the water base very annoying. Here in Italy it's the only rsion veyou can get. What I hate is that it takes a lot to dry and I remain with the ugly feeling of something sticky on my skin. I never wear perfume oils too, but how is it? Does it dry faster or does it stay greasy? Well hey, if he ever releases a perfume with Robin in the name, I'll do the same. I don't think I ever wear it in late summer, but I probably ought too…you're right, it would be just as nice to smell spring on a too hot August day. What do you use to add smoke? Well, bearing in mind that i don't like *any* perfume oils, I find that they never soak in. The water formula doesn't bother me…it's almost like wearing a very light body oil (although it's lighter than most). Ooh! I've been wanting to try this one. Thanks for the excuse to buy a little sample bottle! I have a sample CB 93 and am heartbroken to report that it smells exactly like plastic on my skin. What a disappointment! I love my little sample of Fig Leaf/Revelation, though. I think Memory of Kindness will be my transport – it sounds like it will smell like my Grandpa's garden. I currently have At the Beach 1966 and Fire From Heaven, both of which are great but not evocative for me. Beach is close, but not quite, and I never went to an incense church. I have no trouble with the perfume oils and never have – they soak in or whatever and all that is left is the scent. I tried this one, but to lean to the Columbina school..it's too disturbing. It did smell like an open grave or even a damp cellar. But I have to hand it to CB…I'm a new perfumista and this was my first 'disturbing' frag! I love this one, too. the progression is like walking deeper and deeper into a cold, wet forest in spring. First you're stepping on new leaves, then twigs softened by melting snow and rain, and then into the deeper forest where the pale first leaves are breaking through the crust of leaf mold and frost hardened dirt. CB 93 smells like plastic, really? I'm so surprised. On me it is literally all green and cedar. My husband does not like it though. Your review prompted me to get out my sample of this and try it again. I love its damp earth and twigs scent, but in the past have not cared for the floral note that crept into the drydown. A heavier application might do the trick, though – it really does smell like early spring. I hope you will like MoK — but warning, it's all about tomato leaf! If you don't like that particular, somewhat bitter smell, you won't like it. The damp earth in this really is great, and a heavier application did produce a more satisfying drydown. I agree on Wild Hunt. I hope that he makes a fall afternoon walking near a lake fragrance. I've long thought that when I win the lottery, I'll have him do a custom scent for me. It would take me back to my grandparents' property. Not their house, not their garden, but a half acre my grandfather let go wild for the sake of the squirrels and birds. It had that loamy smell that the damp earth gets after a rain and you could just faintly smell the lilacs in bloom in the garden. There was the huge, decaying stump of a cedar tree on which we used to play king-of-the-mountain (yes, children, it was a simpler time). I'd give anything to go back there – and I'm sure that CB is just the person who could make that happen. That is the smell of summer to me. Not sure if I will want to actually Wear it, but, you know. I have a few things I put on when I'm not going anywhere. 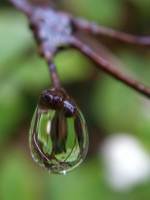 “rain drops, leaf buds, wet twigs, tree sap, bark”…must try!! from this line I just tried “cedarwood tea” and fell in love. But the water was just so short lived… do the perfume concentrations last a bit more? Do perfume oils in general have similar sillage to alcohol based extracts? You think it would smell weird to others? Maybe you're right. The sillage is pretty tame though. Is Joe your fragrance twin? I spray the cedarwood tea on my sweaters before I pack them away for the summer. Not sure I can answer on the lasting power of the water vs. the oil. As I said, I use the water liberally, like a body spray, and most of the scents last around 3 hours — about what I want for an EdT. Alcohol based scents generally project more than oil based. I find the sillage of all the CB line to be light, which makes sense if you read his “I hate perfume” manifesto. It seems to be shaping up that way! I tried Burning Leaves but it sort of eats Black March. So I've resorted to John Galliano. I really, really need a bottle of that stuff. I should stop saying that and buy the darned thing before it disappears. Waaah, but I don't want earthworm. I want jasmine! Oh well, I'll take what I can get. I don't know why I don't have a bottle of JG either. One of my worst is “at any rate”. They're all bad. I give up, I can't cure my verbal tics. Always useful to have one! Evil fragrance twins (who hate everything you love & vice versa) can be useful too. I'm watching for the perfect candidate! I can see how it would be useful. I've had my eye on this one for a while now! I love using different fragrances to go along with the seasons. The Perfumed Court has this fragrance in their “12 months of Scent” sampler set. I'll have to look at that! You could just about do 12 months of seasonal scents just from CBIHP alone. Hahahaha… here I am, finally. H, I will send you my full list and there will surely be things on it that scare you and cause our 'twin' experiment to fail. Have not tried this one, but I have decided that I am WAY overdue for ordering more CB samples. His is one of the first lines I started sampling when I discovered this 'hobby' thing of ours. I fell hard for MoK and Wild Pansy (of which I've been meaning to buy a FB forever). It sounds, though, like nothing I've ever tried, and it's hard to imagine. I know many people say they've gotten a bit of a 'dirt' vibe from Voleur de Roses & Timbuktu, but I don't get any of that. However, the smells of damp, musty earth and rain are some of my favorites, so this definitely seems like a must-try for me also. Mmm, Cedarwood Tea is great stuff and that's a great sweater/clothing storage idea. Zazie, you may want to snare a sample of Ava Luxe Teakwood if you can. It's got a similar vibe, but a bit sharper, and it is STRONG. If you can't order a sample anywhere, feel free to email me via my contact info here and I'll send you a small vial. I'm *very* scared, Joe! Hey, I'll be happy if we agree part of the time. I don't get a dirt vibe from Timbuktu, but I do from Voleur de Roses. I've never tried a CB I Hate Perfume fragrance. Wild Pansy certainly sounds wonderful from reviews! Thank you, that's really nice of you! I love the strong citrus note and the very “round” cedarwood note in CT. It is simple and beautiful. I will try and see if the Ava Luxe line is carried in EU and let you know! Oh, even here I think Ava Luxe may only be available direct from her own website, but good luck to you! Thanks for the review – I love Black March. Also M. Hulot's Holiday and Wild Hunt. I love I Hate Perfume! I've been reading the CB website, and your NST reviews……..CB sounds so intriguing, and unusual, I couldn't help myself……. I ordered Black March, Mr Hulot, Memory of Kindness, In the Summer Kitchen and Fire From Heaven. I tried to keep my purchases in a summery/spring vein, for the coming months…….luckily the autumn/winter appropriates can wait for when my bank balance recovers. I recently tried writing a list of fragrance notes and general smells that I love, and what i associate them with….I think Angela suggested this in an article, to help budding perfumistas articulate what they are drawn to and guide us through our explorations. I ended up writing things like “The smell of my dad's fireplace in winter”, “the herb garden in summer”, “salty sea-spray on the pebbley beach at Aldborough”, etc etc. Bless CB for making fragrances that try to capture these memories and scent associations!!! I'm really looking forward to the arrival of the darling little samples, with their darling little draw-string bags and complimentary sweeties……. Oh, I do hope you'll like some of your new samples — and that they'll fit with some of those favorite smells you listed. I have just (litleraly JUST) tried this in the oil. How interesting! Not quite sure what to make of it but I think I like (tentativley) it. It does indeed remind me of the earth, dark and damp, but in a “warm” comfoting way. Am I nuts? I hope to continue liking it more as it continues its unfolding in the next few hours. Let’s see what happens. Yup, still like it – actually kinda loving it now. No graves for me, and only a tiny slight bit more earthy, thank goodness. I think I am buying a bottle – such an intriguing scent. Cannot figure out what fascinates me about it. Glad you loved it! I think it’s a smell we all know but rarely think about.